The "crash" at the corner of 18th & Walnut Streets. Dodging cars in Center City can feel like a constant fight for survival, and a scene at Rittenhouse Square on Tuesday appeared for a moment to be proof that Philly’s drivers need to slow down. Thankfully, it wasn’t a real crash. 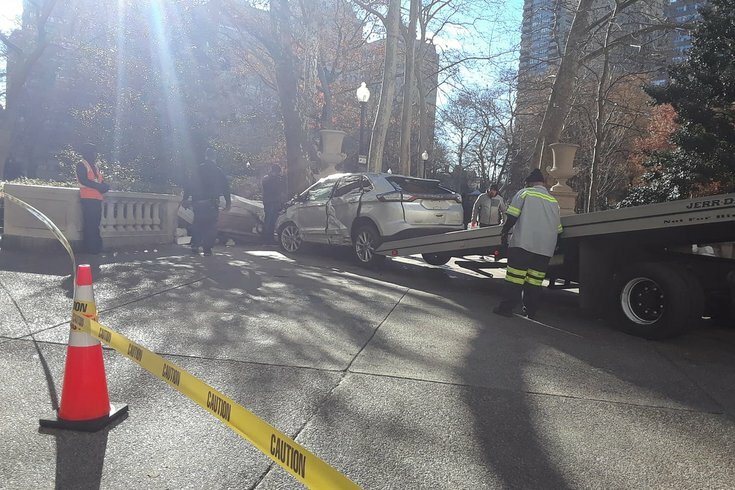 You might notice the car doesn’t have a license plate on the back, and a fake retaining wall has been placed in front of Rittenhouse’s signature, columned ledges to make it look like a collision had taken place. Instead, it’s part of a television show being filmed in the city. A flier made the rounds Tuesday morning, which described exactly where the “crash” took place: 18th Street, between Chestnut and Moravian Streets. The flier says the television show is called “Crumpet” and the production company is called “Uncle George Productions, LLC”. A search for Uncle George Productions turns up a 9-month-old production company based in Pennsylvania, but information on a television show called “Crumpet” was less available. Considering production companies often use fake names for film sets in order to throw celebrity-chasers off the scent, it could be anything. Now I'm hearing it's an M. Night Shyamalan film and Ron from Harry Potter was downstairs buying coffee in Joe's. It's definitely filming for something; we watched from above as they painstakingly maneuvered the already-smashed car into place with a flatbed truck. We'll eventually find out who was filming there.